The SoCalCycling.com Team is very fortunate to have Full Speed Ahead (FSA) as one of our team sponsors which supply us with handlebars, stems and cranks. The FSA Energy Compact Handlebar is the handlebar that I am currently riding with and with it’s comfort, stylish looks and light weight it will make your bike a dream ride. 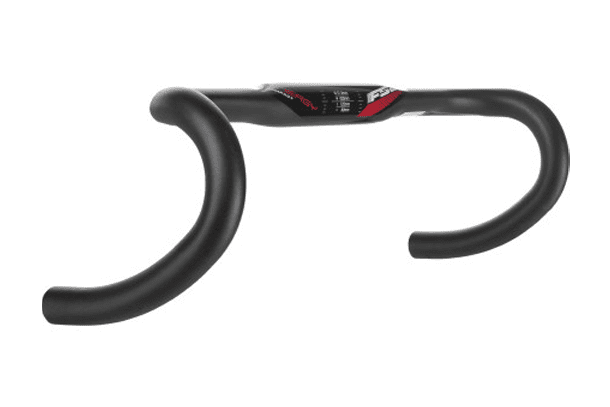 The FSA Energy Compact handlebar is a very aggressive bar with its 34mm flat top which makes for a very comfortable riding when your hands are on the top of the bars. The 125mm reach and 80mm drop gives you a great feel of the bar and makes you and the bike connect into one. The stiffness of the bar as well as it’s light weight of only 269 grams for a 42 cm gives you a win win whether you are looking for a great performance handlebar or a light ride. The bend of the drops feels just right and the slightly flattened top of the bar makes for extra comfort when climbing or just riding on top of the bars. The stiffness is very noticeable when sprinting out of the saddle as there isn’t much flex in the FSA Energy Compact handlebar due to the flattened top and 31.8 diameter. Sizes that are available include: Diameter 31.8mm & width of 380, 400, 420, 440mm (center to center) and color comes in a sandblasted black with polished black anodized. This is really a great handlebar for all cyclists! Make sure when you are shopping for your next bar to check out the FSA Energy Compact handlebars. More information on the FSA Energy Compact Handlebar and other FSA products, please visit fullspeedahead.com.